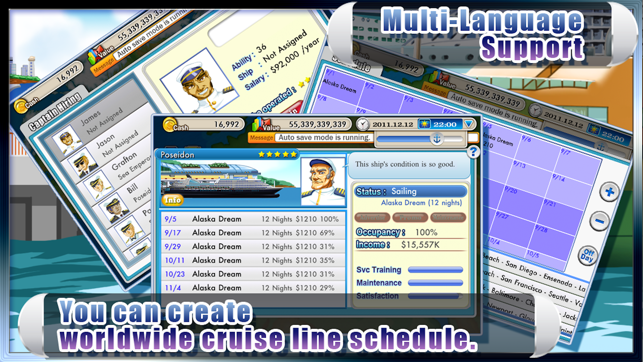 Cruise Tycoon ranked the #1 Role Playing game in UK, Norway, Netherlands, New Zealand, Swiss and Finland. Thank you for your great supports. 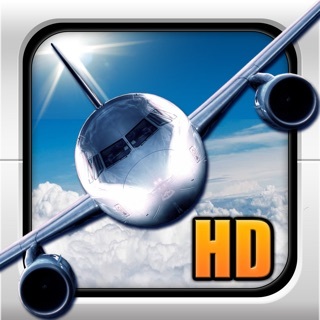 Dedicated iPad version is also available. I love tycoon games and there are not a lot of good ones on the market IMO. 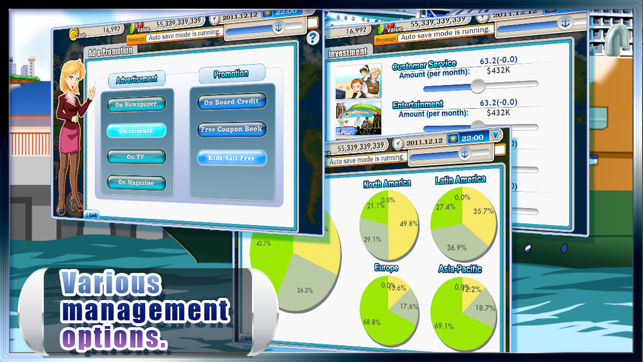 This company is the only one that I’ve found that can build a great tycoon game from their Airplane ones to their Hotel ones. I loved them all. 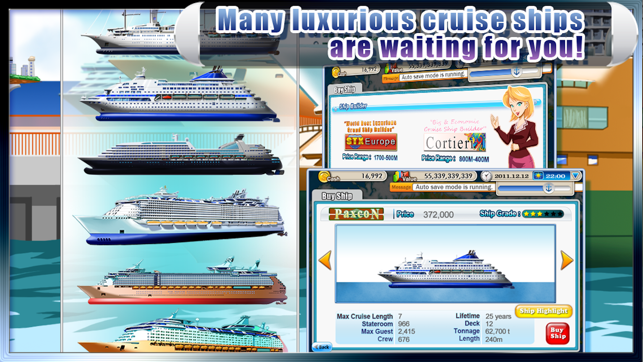 Cruise Tycoon was the first one I ever downloaded and still love to play it today. When I found out it had to be updated for iOS 11 and was unplayable I was pretty sad. I emailed the developers maybe a week or two ago and just saw the update today! I’m ecstatic! It seems that Hotel Tycoon 2 also needs an update though. I understand the map’s graphics can look a little outdated but the ship and captain graphics are not and that’s what I liked. 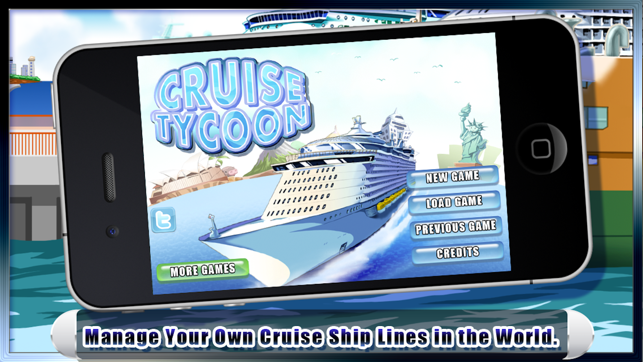 My only complaint (if it even is one) is that I would love a Cruise Tycoon 2 and a Hotel Tycoon 3 but I understand the developers may be working on other projects. There’s not a lot of games left that don’t nickel and dime you just to play and I love these apps for that. If they wanted to make more money off the new versions I would pay $5+ for the new ones but that might come at a decrease in sales. It’s up to them what they do from here. I am just happy that I can still play this game. I love it! Thank you! And it’s fun... until you realize that the underlying maths are somehow all wrong. For example, I was trying to win the game at the medium level, had 50 ships, twice the tonnage of the nearest competitor, almost all ships in North America, advertised, promoted, sailing full... and yet only a 25% market share in North America while 2 competitors each had a 34% market share even though each had a commanding (60%) market share in another region. It doesn’t and can’t add up. If they fixed that one issue I could more easily overlook the other issues like how the port cancellations are doled out and handled... or huge sums of money are subtracted out of your current account for no apparent reason. There also appears to be nothing you can do to increase passenger counts in off season... all the tools have no effect. 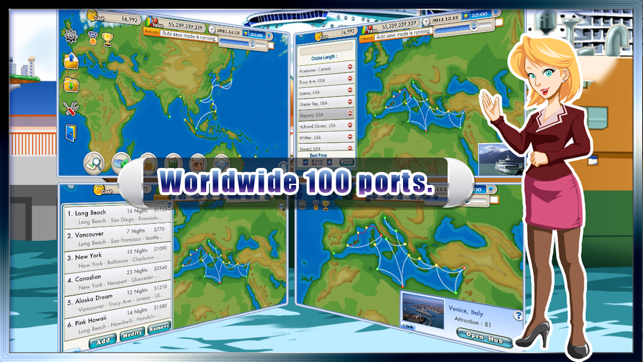 The computer will fill your ships to 100% June through August and over Christmas no matter how crappy they are, and only give you about 65-70% full at other times no matter how great they are, how desirable the port, or how much you advertise or promote. Pretty sure this was made by a foreign country, which is absolutely fine, but the misspellings and language errors in the game are indicative of this probably being an Asian-made game. It makes for some funny reads in the game. It's a pretty simple game once you get used to it. There's not too much to the game, leaving you feeling a bit unchallenged. Be patient! I know it sounds impossible without buying in game content, but just slide the time slider all the up and you'll be making money in no time. It's definitely addicting but gets old after a while. Great job on the game guys.